The above is the rare result of a beautiful experiment in the kitchen – No recipe, no measurements, just pure instinct (that turned out right, phew) and a strong will to use up all the random leftovers in my too full fridge and freezer. With a small block of mature cheddar and a handful of frozen blueberries, I wanted to make something actually edible, so I guess throwing them together with flour, baking powder, milk and eggs can’t go very wrong can it? While Blueberry Cheese Bread is usually made with cream cheese for that cheesecake-like texture, the sharpness of the cheddar was a good contrast to the juicy sweetness of the blueberries. 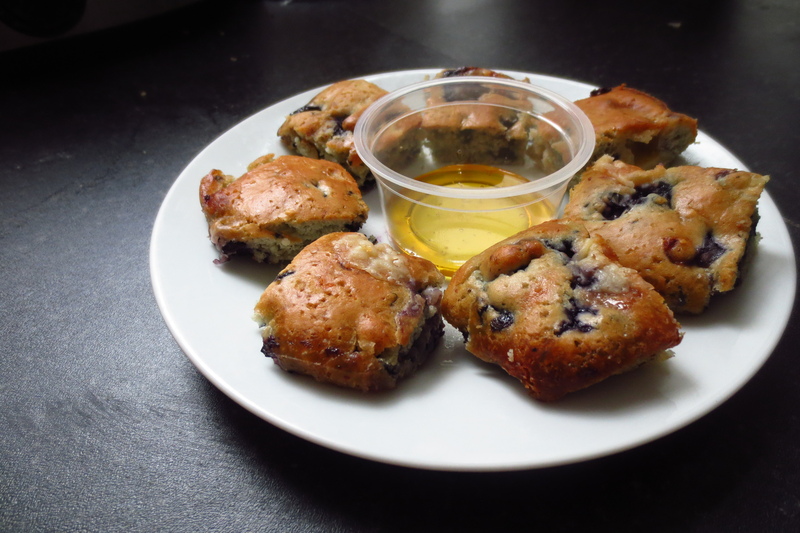 The texture is in between a muffin and a bread – Lighter than a muffin as I used olive oil instead of butter, more complex than a bread as it was somewhat moist like a cake. I didn’t add sugar in the bread so it was a little lacking on the sweet-oomph factor but with a honey dip it was perfect!